In collaboration with the Anticoagulation Forum, the University of California, San Francisco Pharmacy School is conducting a survey, "Anticoagulation Providers and Warfarin Pharmacogenetics." Anticoagulation therapy providers in North America are asked to participate. The topic of this survey concerns the clinical application of warfarin pharmacogenetics. As you may know, the FDA recommends lowering the starting dose of warfarin in patients with certain genetic variants. 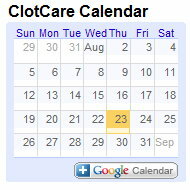 See http://www.clotcare.com/clotcare/warfaringenetictesting.aspx for more on this issue. The objective of the study is to identify those factors that may influence the clinical application of this new recommendation because it requires the application of new knowledge and technology. This survey study has been approved by Committee on Human Research at the University of California, San Francisco. Questions may be directed to Jaekyu Shin, Pharm.D, BCPS at 415-514-2747 (office, from 8 AM to 5 PM Pacific Standard Time) or email me at shinj@pharmacy.ucsf.edu. Data collected from this study will be used only for research purposes. The conclusions of the survey and the answer keys to the knowledge questions will be shared after completion of the study. Please indicate your desire to receive this information by providing your name and address at the end of the online survey. Your identifiers will not be linked to the survey questionnaire. Those conducting the survey anticipate that it will be completed by June, 2009.